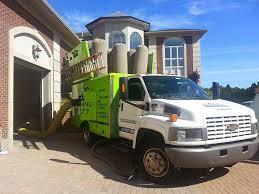 The first thing you will notice when you choose to hire Amistee is our vibrant green vacuum trucks. 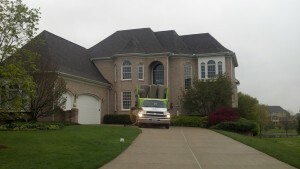 We only use vacuum PTO-driven trucks because they are the most powerful in our industry and allow us to properly clean the entire HVAC system in your home or business. The vacuum pulls 16.000 to 17,000 cubic feet per minute of air. This powerful suction allows our technicians to pull all the contaminants from your vent system without causing any damage to the ductwork. Our process uses negative pressure to pull everything down through the ductwork, out through our hose and then into our vacuum-mounted truck. This process removes any contaminant that has the potential to become airborne and provides a thorough air-washing of your entire system. Our technicians will also go to each of the registers and use compressed air to agitate anything that has built up along the sides. We take great pride in providing a complete cleaning so when you choose Amistee, you know you are hiring experts you can trust. If a homeowner or business owner chooses to hire a company that does not have an understanding of the many different components of an HVAC system and does not have the correct equipment to provide a thorough cleaning, they run the risk of causing damage to the ductwork and the heating and cooling equipment in their home. We encourage those that are interested in having the ductwork cleaned in their home or business to make sure to ask what equipment is going be used and what is involved in the process. A vehicle with a vacuum-mounted system has the proper suction to provide a complete vent cleaning and properly remove all the debris and pollutants that have built up with the ductwork.